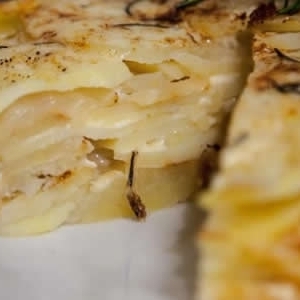 Roll the puff pastry or salted shortbread in a baking pan and lay down in layers the cheese thin sliced, then the diced potatoes, the rosemary and the beaten eggs mixed with cream; add salt, pepper and spread the grated cheese. Bake for 50 minutes at 180°C. Serve as appetizer.